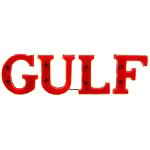 This rare sign is for Gulf oil. The letters of the sign are in red, and illuminated with red neon. Each letter stands independently.